The renovated Alice Tully Hall announces its presence with a sharp prow that steers toward Broadway, riding a spray of light. A building that once girded itself in concrete now slips easily between outside and in. The ceiling of Lincoln Center's chamber-music venue becomes a canopy that shelters a sidewalk grandstand, which in turn offers a view of the great indoors. The hall has shed its armor, and a wraparound glass wall proudly makes lingering in the lobby a spectator sport—a free activity, since tickets get collected farther inside. The auditorium has retained its shell. There was no flexibility to reshape the space or move the awkward side entrances to the back, though a new stage does flow out into the hall, bringing musicians and listeners closer together. Working around the edges provided just enough leeway to fashion a completely new experience. The designers have dubbed the feat “architecture in eighteen inches,” because that is the distance between the hall’s old bones and its new skin. Subtle lighting hides behind the wood veneer, so that when the house goes dark, the walls emit a reddish glow. Swooping balconies, wavy panels, and the stage’s shapely lip make the room feel soft and inviting. — Justin Davidson … More. 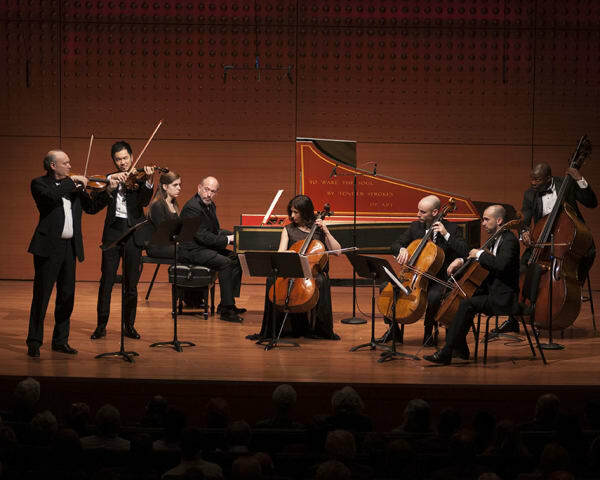 A New York holiday season would be incomplete without the performances of Bach’s eternally fresh Brandenburg Concertos. CMS musicians lend their remarkable talents to this festive annual tradition.